Brunch N' Cupcakes: One Dud and Two Wins! One Dud and Two Wins! Well as the title suggests one recipe was a total flop this week while two were hands down delicious! I have to say that we have had some pretty good turn outs with recipes! Lets lets refresh, this weeks menu looked something like this! 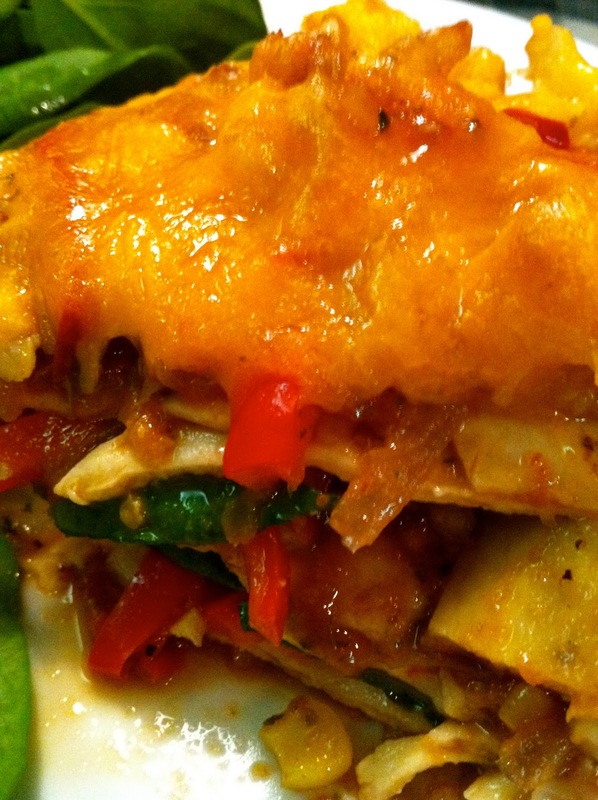 Lets take a look at this Stacked Roasted Vegetable Enchilada a little closer! I know a lot of you were curious as to how this would turn out! 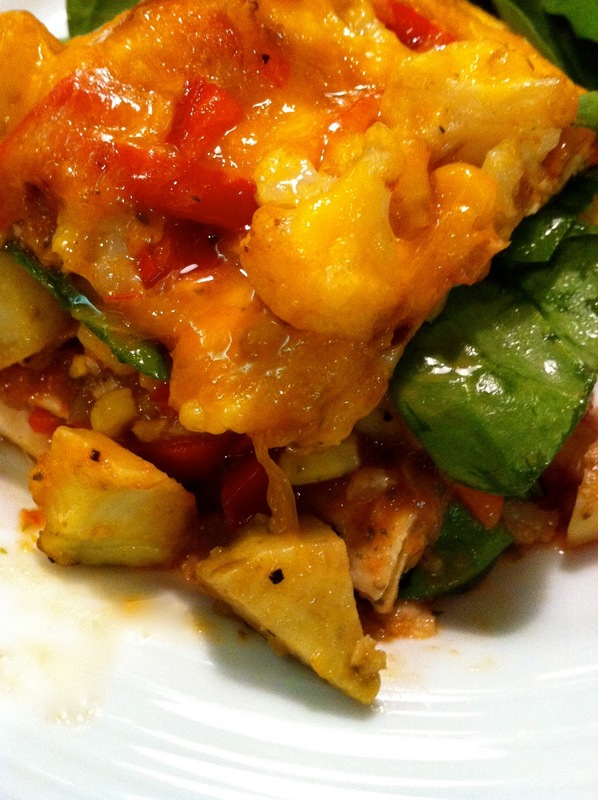 And let me tell you this dish is delicious, if you have this recipe pinned you need to make it. I know it takes some time to roast veggies, but in the end the extra time is worth it. I loved the sweet note that the sweet potatoes played in the dish, and well I am always down for a recipe that is loaded (I mean loaded) with veggies! 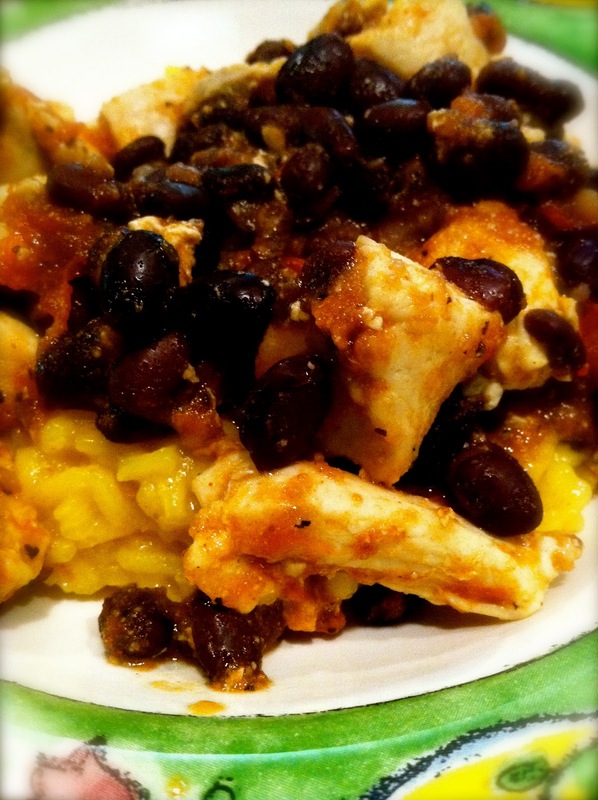 Add some black beans and chicken for a little extra protein! I served this with a side salad, yes even more vegetables. I actually cut the amount of cheese down to 3/4 cup instead of the 2 cups called for, and instead of putting cheese between every layer I just topped the dish with the cheese. And I used 7 tortillas. Not the best picture, but still it was delicious! Why was it a dud you ask? The tofu had zero flavor I mean none! This dish was rather bland and nothing like an authentic pad thai. I read the review for this dish and made some modifications but in the end it just wasn't good! Sorry Clean Eating I am going to stick with this recipe! And lets end on a win this fine Friday morning! Cooking Lights Beans and Rice with Chicken and Chorizo! Delicious. I subbed in Vegetarian sausage for the Chorizo and was extremly happy with the outcome! The recipe only called for salt and pepper but I added garlic, paprika and cumin. I thought the additional spices added a nice kick! I could use more go to recipes like this. Recipes that are delicious, healthy and take no time to prepare! Are there any recipes you have tried lately that you were excited about and they ended up being a total flop? Tell me about it! And before I leave I am going to link up with Sarah of Simply Sarah for Inspiration Friday. One goal I had for 2012 was to live more in the now verses worrying about things that are happening in the future our out of my control. This week I had to look at this quote several times, because I noticed myself getting anxious (you know the feeling) about things that are simply out of my control! No point in worrying about things that are out of our control, or over planning the future! Focus on the now, don't let it pass you by! Those enchiladas are looking so good Hilliary. Love it. I like this idea of you trying new recipes every week, unfortunately once I come home I have no energy to cook. So I do a lot of my cooking over the weekend. that last quote is so true... thanks because i needed it after someone tried to take away the successes of this week! I love the quote, I definitely needed that! Miss you! I agree about living in the now, it will make you so much happier! This year I'm trying to just take it one day at a time. Sorry about the dud! Glad you had some winners too :) Have a great weekend! OMG I love your recipe re-cap! Tofu has never been one of my favorites...unless you drown it in salad dressing, I prefer meat. I want to try the other two! Happy weekend!! That is great! I am so willing to try these now! Thank you so much! By the way, how have you been doing? It's been ages since I've had the time to catch up on my favorite blogs... I've been trying out some recipes too, but I prefer if someone else does the taste test for me ;) ahaha!